This Mini Challenge comes from Melissa at Must Read Faster. Look to the left . 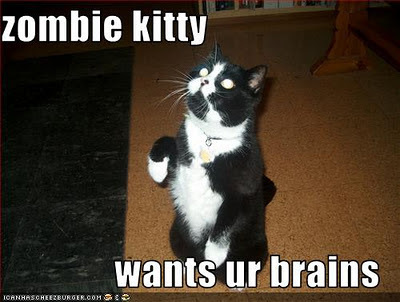 . . the first item that you see if your only weapon during the Zombie Apocalypse! (Don't cheat and try to find something cool! If the first thing you see are socks, that's what you get!) If you can, post a picture just for the extra lolz. 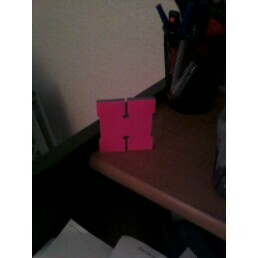 So I got the fluorescent colored Post-It Notes in the shape of the letter H. Lucky me! Okay, so here's what I would do. This being my story and all, the zombies in my Zombie Apocalypse would be seriously OCD. So I would sticker them with the Post-It Notes and run like the wind while they took the time to peel the Notes off. Have you ever had to take a whole bunch of Post-It Notes off something? Not necessarily a quick process. That would buy me a little time although I guess I had better hope that my human headquarters are at the Post-It Note factory! That's my Zombie Apocalypse weapon. What's yours? I love it! OCD zombies...LOL!